VOA High School (VOAHS) is a state approved, contract alternative program serving Minneapolis Public School (MPS) students. The school is located at the VOA Education Center at the Hiawatha Light Rail station near the intersection of Cedar and Franklin. VOAHS prizes its diverse student population — serving students from all over the metro area as well as neighboring suburbs. This program allows for credit make-up and student success by offering flexible scheduling, small class sizes, extra credit earning opportunities, an on site independent study program and substantial student support. An additional feature is an experience & service learning component. 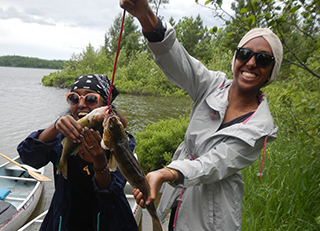 Students have an opportunity to focus on leadership development and community service learning through hands-on experiential learning, outdoor adventures and environmental activities. Here's a video made by Minneapolis Community Technical College students that offers a glimpse of why we believe we have such a special place at VOA High School! Serving students in grades 10 -12 in need of a smaller educational setting and credit make-up, VOA High School is now and forever committed to meeting the educational needs of Minnesota youth. Students who have attended a Minneapolis Public School or MPS Contract alternative school may enroll at VOAHS at any time throughout the school year. Students new to Minnesota, the Minneapolis Public School district, in need of language support services or special education services must contact the MPS placement Center before enrolling at VOAHS. When VOAHS is at maximum enrollment, students will be placed on a waiting list. Students must complete registration materials before attending and parent or guardian approval is necessary for enrollment. Please contact the school office at 612-375-0700 for more information.